At present, roughly 11 million people receive some form of compensation under the Social Security Disability Insurance Program (DI). The vast majority of these beneficiaries are disabled workers themselves, and a far smaller share is spouses and children of disabled workers. While 11 million people rely on this program, it is facing and impending financial crisis. The DI program is currently in cash-flow deficit. In FY2013, DI spent $142.8 billion but only collected $102.7 billion in non-interest income, meaning the federal government had to borrow $37.0 billion to finance program expenditures. 2013 was the eighth fiscal year in a row that DI has been in cash deficit, with the program having added over $172.1 billion to the federal debt since 2006. More pressing yet is the imminent exhaustion of the DI trust fund – which finances DI benefit payments. Both the Congressional Budget Office (CBO) and the Social Security Trustees expect the trust fund to be exhausted by 2016. Upon exhaustion, the program would only be able to pay benefits at the level of payroll tax receipts, which would impose a 20 percent cut in benefits on recipients. Many other nations have faced similar challenges in their safety net programs for disabled workers, and reforms to address these have had mixed results. Important lessons can be drawn from these experiences, particularly with respect to longer-term programmatic reforms. U.S. policymakers, however, will need to address these longer-term challenges, as well as pressing concerns confronting the financing mechanism for DI benefits: the DI trust fund. These reforms can be grouped into 3 general categories: accounting changes specific to the DI trust fund, revenue changes, and benefit changes. The DI trust fund faced exhaustion as recently as 1995. Indeed, the 1994 Trustees report projected fund exhaustion by 1995. As a result, Congress passed the Social Security Domestic Employment Reform Act of 1994, which allocated a greater share of payroll tax receipts to the DI Trust Fund. Payroll tax reapportionments had also been enacted in past reform efforts. These reapportionments at times increased the relative share of DI receipts, while at other times decreased the share in favor of the OASI trust fund. If overall payroll taxes do not change, there is no fundamental change in the combined funding challenge for social security. In this way, it is simply politically expedient policy, a trait shared with another accounting change, interfund borrowing, noted below. 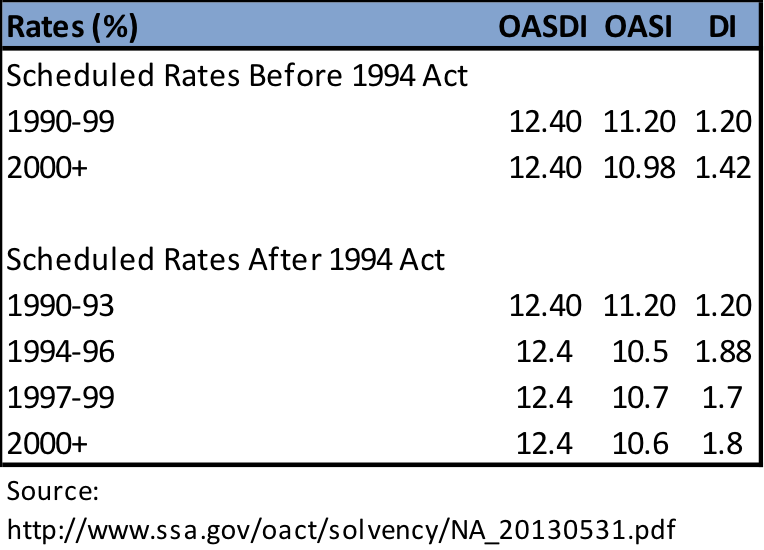 The rate schedule enacted in 1994 is still in place today. This reallocation of tax rates changed the expected date of exhaustion of the DI Trust Fund from 1995 to 2016 according to the 1995 Trustees report. The late 1970s and early 80s saw material deterioration in Social Security’s finances – for both DI and OASI, and several reform efforts were attempt to address these challenges. In 1981, Congress authorized the OASI, DI and the Medicare Hospital Insurance (HI) trust funds to borrow from each other, which effectively consolidated the financing of America’s largest entitlement programs. The borrowing authority was exercised several times, totaling $17.5 billion in loans from the DI and HI funds, but has since lapsed. As of the last Medicare Trustees report, the HI trust fund had $220 billion in assets and was projected to remain solvent until 2026. The OASI trust fund had $2.6 trillion in assets and has an exhaustion date of 2035, compared to $122 billion in the DI fund. Accordingly, there are sufficient assets in other trust funds to extend the life of the DI trust fund beyond the current forecasted exhaustion date. If past experience is any guide, the most likely approach to changes in the DI that policy-makers will pursue in the near-term are accounting changes that will hold both taxpayers and beneficiaries harmless. The only real impact of these changes will be the degree to which any accounting change worsens the outlook for the OASI program. However, at some point policymakers will no longer be able to rely on the relative strength of OASI’s finances to bolster the DI program and will need to pursue additional reforms. These reform options either increase revenues, or decrease spending, for the DI program, and are based on estimates from the CBO. CBO examined several revenue measures, including the amount by which the DI tax rate would need to increase to equalize DI receipts over the 75 year horizon. This balance could be achieved by increasing the DI tax from the current 1.8 percent to 2.2 percent. This would increase revenues by $28 billion in 2022. However, while this would constitute a significant revenue increase, it would not immediately close the financing gap in 2016 of $30.1 billion. CBO also examined expanding the taxable earnings base to raise additional revenue devoted to the DI trust fund. As of 2010, 84 percent of Social Security-covered earnings were below the minimum taxable earnings limit, which is projected to decline to 83 percent by 2037. Increasing the ratio to 90 percent would increase the minimum taxable earnings limit from $113,400 in 2013 to $174,000 in 2022, and thus exposing a greater amount of income to the DI payroll tax. The 90 percent ratio was last achieved in 1983, a year which also saw the last major changes to the financing of the Social Security system. This option would raise $13 billion in 2022. Under current law, DI benefit amounts are determined in part by primary insurance amount (PIA) factors, which are the progressive replacement rates of a person’s lifetime average monthly earnings adjusted for inflation. Presently, these factors are: 90 percent, 32 percent and 15 percent. For the purposes of this estimate, 2011 income figures are used. In 2011, DI beneficiaries received 90 percent of their first $749 in average monthly earnings, 32 percent of earnings between $729 and $4,517, and 15 percent of earnings above $4,517. A reduction in PIA factors of 15 percent for new beneficiaries would reduce these replacement rates to 77 percent, 27 percent, and 13 percent, and would decreases the average person’s DI benefit in 2012 by $167. This would reduce program expenditures by $22 billion in 2022. However, reducing these benefits could increase spending on Supplemental Security Income (SSI) and Medicaid, since people who receive fewer DI benefits may become qualified for those programs. Such a reduction could increase spending on Old-Age and Survivor’s Insurance (OASI) if people choose to retire earlier instead of collecting DI benefits. Under current law, workers that retire at age 62, or before the full retirement age, receive a reduced retirement (OASI) benefit. However, if a worker moves onto the DI rolls, and then to OASI at full retirement, they do not experience a similar reduction in benefits. To address this issue, CBO examined a policy options that would permanently reduce new benefits for people born in 1960 or later by 3 percent for each year of age above 52. For example, a 53 year-old in 2014 (born in 1961) would receive a 3 percent cut; a 54 year-old in 2014 (born in 1960) would receive a 6 percent cut; a 62 year-old in 2022 (born in 1960) would receive a 30 percent cut. The policy assumes that the cuts are permanent, so a person does not see his benefits reduced by greater amounts as he ages. The policy also assumes that starting in 2022, people between the ages of 62 and 67 would receive a DI benefit equal to the Social Security benefit for which they are eligible to receive at that age. The average person’s DI benefit in 2022 would decrease by $50 for 53 year-olds and $600 for 62 year-olds. This option would reduce outlays by $6 billion in 2022. A number of federal laws, including tax rates and benefit programs are annually adjusted for inflation. These adjustments are based off of the consumer price index for urban wage earners and clerical workers (CPI-W). However, there is reason to believe that this index overstates price inflation, and as a result, increases benefit payments in excess of the need to keep up with inflation. An alternative index, known as chained CPI, is an alternative price index that may be more accurate, and is projected to grow more slowly over time than the CPI-W. Using the chained CPI index to for DI cost of living adjustments (COLAs) would therefore slow the growth in benefit payments. For example, with CPI-W, an average beneficiaries’ DI benefit would increase by $233 from 2013-2022. Using chained CPI, that same beneficiaries DI benefit would increase by $201 from 2013-2022. Using chained CPI for DI COLAs would reduce program expenditures by $3 billion in 2022. As noted above, DI beneficiaries can remain on the DI rolls until they qualify for full retirement. Rather than reducing new benefits based on age, another policy option would be to simply eliminate eligibility for DI for anyone over the age of 62. This would reduce program expenditures because early retirement benefits are not as generous as combined DI and full OASI benefits. Indeed, benefits for individuals could be 30 percent lower under such a regime. Savings to the DI program would be $11 billion. However, to the extent that this policy would induce more individuals to enter early retirement and become eligible for retirement benefits, OASI spending would also increase by $9 billion in 2022. Net savings for the Social Security system as a whole would be $2 billion. Eligibility for DI benefits is in part determined by work history. Under current law, to qualify for benefits workers must have worked at least 5 years (this requirement increases over the age of potential beneficiary), with 5 of the total required working years having occurred in the prior 10. CBO examined an option that would restrict benefits to applicants who have worked 4 of the past 6 years, instead of 5 of the past 10 years. This would save an estimated $8 billion in 2022. An important determinant in DI eligibility standards is the degree to which an individual may find other work. These standards become less restrictive for older age ranges. Under current law, these factors ease at age 45, 50, 55, and 60. CBO examined a policy option that would adjust these thresholds upwards by 2 years, and eliminate the last adjustment currently at age 60. This proposal would produce programs savings of $1 billion. To be awarded DI benefits, eligible recipients must have earnings below a threshold amount for 5 months during which time they receive no benefits. CBO examined one option that would lengthening this period to 12 months and might deter some individuals from enrolling in the program. Disabled workers would still receive retroactive benefits for the waiting period. CBO estimates that this would reduce program outlays by $11 billion. When DI applicants are denied benefits, they can appeal to a hearing before administrative law judges. Applicants are allowed legal representation for the hearings, whereas SSA is not. Allowing legal representation for SSA may cause more applicants to be fail their appeal hearings, reducing the number of DI beneficiaries. Increasing the expertise and training of administration law judges that preside at the appeals process may introduce further efficiencies. They effects of these changes are difficult to quantify however, and CBO has not estimates potential savings. The Social Security Administration conducts continuing disability reviews of beneficiaries to verify continuing eligibility. Increasing the frequency of CDRs would cost additional money, but in general, expenditures on such program integrity measures tend to net savings. Under the Budget Control Act, the spending caps can be adjusted upwards for additional program integrity measures. While CBO did not estimate what incrementally more program integrity spending would yield, for reference it is worth noting that in CBO’s original cost estimate, $4 billion in program integrity spending was estimated to save the DI program, SSI, Medicare, and Medicaid $12 billion. The reforms noted above reflect estimates for changes to the existing DI system. However, more fundamental changes, while unlikely to mitigate the near term financing challenge confronting the DI system, may offer valuable approaches to assuring the DI system is available for the needy. The approaches undertaken by other nations also offer some valuable lessons. In general, once individuals enter the DI rolls, they are unlikely to return to work. Therefore one important policy intervention could be to assess threshold criteria. For example, many younger workers were entered the DI program owing to mental health or musculoskeletal conditions, but may otherwise be capable of work. Reexamining such eligibility standards may preclude otherwise productive workers from entering the DI program. Additional options could include moving to a partial disability system similar to the Veterans Affairs process. Reforms may also include a role for employers, which have been reflected in policy changes in the Netherlands and the United Kingdom. However, in the present economic climate, it is important to be mindful of the negative employment effects of a new program that could increase the cost of hiring workers, or discourage the hiring of disabled workers. Note these estimates assume 2013 enactment.